Business mobility is a top priority for most organizations because the benefits of supporting a mobile workforce are very clear: happy employees and greater productivity. However, implementing the collection of technologies required is a challenge for IT. 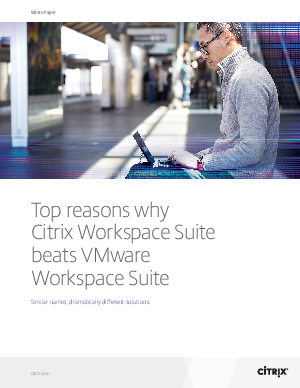 Citrix Workspace Suite brings together award-winning technologies into an integrated solution that provides people with secure access to apps, data, desktops and IT services seamlessly across whatever device they happen to be using. This is the mobile workspace in action. Competing solutions may sound similar, but there’s really no comparison. Get the facts you need to make the best decisions about business-mobility for your organization.